I was persuaded to read this book after enjoying a blog post by the author Ann Richardson, a fellow ALLi author, about how she had been selling copies to strangers who looked as if they might enjoy it! She is American and has a typical American directness about her, but is also a seasoned researcher and writer who clearly understands what makes people tick, and is fascinated by their motivations and attitudes. I’m not a grandmother (though I do have step-grandchildren), but I was very close to both my late grandmothers, and I’m glad that my daughter is close to hers, so I totally get the potential significance of grandmothers in everybody’s lives, and I am sad for those whose relationships have broken down or never been established. Celebrating Grandmothers (subtitled Grandmothers Talk About Their Lives) brings together the research that Ann Richardson undertook among a set of 27 grandmothers based in different parts of London, with ages ranging from 46 to 88, though they had become grandmothers at different ages, one as young as 36. As she says in her introduction, this wasn’t meant to be a representative cross-section of grandmothers of the world, but she did include different socio-economic, ethnic and religious groups. For the sake of confidentiality, and to encourage franker discussion of sometimes difficult or embarrassing subjects – such as having favourite grandchildren, or sharing details of problems and challenges – she has anonymised all the responses, so we are not told anything about the source of each quote. Statements are simply attributed to “grandmother of three” or “grandmother of eleven” or whatever. I understand her reasons for this approach, but personally I’d have been interested in knowing the context of each quote. which would have added a further dimension, e.g. 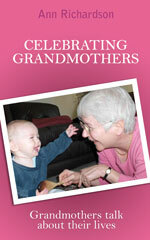 how do the views of grandmothers of different ages or ethnic groups or religions compare. The book is well structured with the various quotes from the 27 interviewees organised into topics and sub-topics. The contents list at the front makes it easy to dip into when seeking thoughts on a particular subject e.g. “Disagreements on child-rearing”. Although this is not presented as a self-help book, I’m sure many grandmothers will find this a useful resource, offering them an insight into how their peers deal with and react to various grandparenting issues. It will also encourage them to make the most of the wonderful, enriching opportunities that being a grandmother presents to individuals, and help them avoid the pitfalls that have caused breakdowns in other families’ relationships between generations. I’m sure plenty of grandmothers will want to buy it for themselves (not least because it carries tucked away on its back cover a glowing endorsement from Jane Fearnley-Whittingstall, mother of the more famous Hugh, and author of The Good Granny Guide). I can imagine a new or prospective granny poring over it in the same way that I used to read The Rough Guide to Pregnancy when I was expecting, savouring every moment and trying to become an expert in advance! It’s also apparently a popular buy for mums and dads who want to show their children’s grandmother their appreciation, or even as a covert announcement of a new pregnancy!